The Spanish word “fajita” means “little strips” and comes from the word “faja,” which means “belt,” “strip” or “girdle.” It refers to the strips of meat (usually skirt steak) originally used for this Tex-Mex dish. Today, fajitas have expanded their range to include pork, chicken, and shrimp. Fajitas are fun to order in a restaurant and create yourself from a steaming iron serving tray. But why leave that all that eating excitement at the restaurant. You can make your own and have a Tex-Mex feast at home for the two of you. To make the marinade: In a 1-quart zippered bag, combine 3 tablespoons olive oil, lime juice, chili powder, cumin, crushed garlic, and 1/4 teaspoon salt. Add the pork chop and marinate, turning occasionally, in the refrigerator for 4 hours. Heat the oven to 180 F. Wrap the tortillas in a couple of paper towels and warm on a cookie sheet in the oven. Remove the pork chop from the marinade bag and pat dry. Sprinkle both sides with chili powder. Heat 1 tablespoon of the vegetable oil in a heavy skillet (cast iron is best, don't use nonstick) over high heat until just short of smoking. Add the pork chop and cook for 1 minute, reduce heat to medium-low and flip the chop. Cover and cook 5 to 7 minutes. Remove the pork chop to a pie pan and place in the oven to keep warm. Add the remaining tablespoon of the vegetable oil to the same pan and increase heat to medium. Add the peppers, sprinkle with cumin and cook until just softened, stirring occasionally. Add the jalapeno and garlic and cook 1 minute more. Add the tomato and green onions and cook 1 minute longer, then remove from heat and cover. Remove the pork chop from the oven and slice it very thinly across the grain. Add the pork to skillet with peppers and mix. 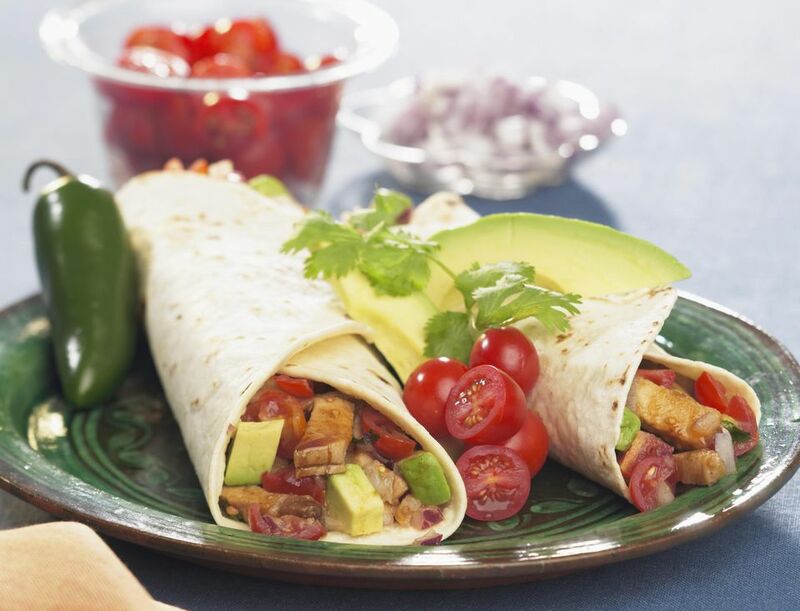 Divide the mixture equally among the tortillas and add garnishes as desired.